This Website Is No Longer Active. : This is Medical Negligence. 1 x 60mg super strength morphine pill kills Grandfather.80mg of Oral Morphine prescribed by Doctors for Linda's daughter aged 11 is not Medical Negligence.This is Attempted Murder. This is Medical Negligence. 1 x 60mg super strength morphine pill kills Grandfather.80mg of Oral Morphine prescribed by Doctors for Linda's daughter aged 11 is not Medical Negligence.This is Attempted Murder. The following is taken from The Daily Mirror of the 13th of July 2011. Our deepest sympathy goes out to the family and friends of the victim John Bradford-Fawson. The article states that " A distraught widow is to sue after her husband was killed by a 'fatal tablet' because blundering staff handed over painkillers six times more powerful than prescribed." Grandfather John Bradford-Fawson, 76, fell unconscious and never woke after wife Eileen, 62, unknowingly fed him a super strength morphine pill. Devastated Eileen yesterday blamed a 'catalogue of errors' by surgery and pharmacy staff for her husband's death.Eileen, who was married to father-of-one John for 25 years, fed her husband the pill and he died three days later without regaining consciousness. 'I was so worried I didn't give him all the tablets, I only gave him one. But it was the fatal tablet, I'm 100 per cent sure about that. He went to sleep and that was it, he never woke up again." 'I cannot accept a verdict of natural causes. This must an accidental death, or at worse manslaughter. This is a case of the establishment protecting each other. Whilst medical negligence and human error appear to be the main cause of the wrong strength of morphine being given in error in this case. There clearly is no human error in the prescription below. It was cynically and deliberately issued to Linda for her 11 year old daughter by Dr O'sullivan of Singleton Hospital Swansea whilst she was under the care of Dr Dewi Evans. If Linda had given the above prescription to her daughter she would have been dead. Linda would then have been arrested for killing her own child and jailed. If this had happened then there would have been no further case for the guilty and incompetent Doctors to answer. They would have got away with it. 1 X 60mg super strength morphine pill killed a fully grown male John Bradford-Fawson. 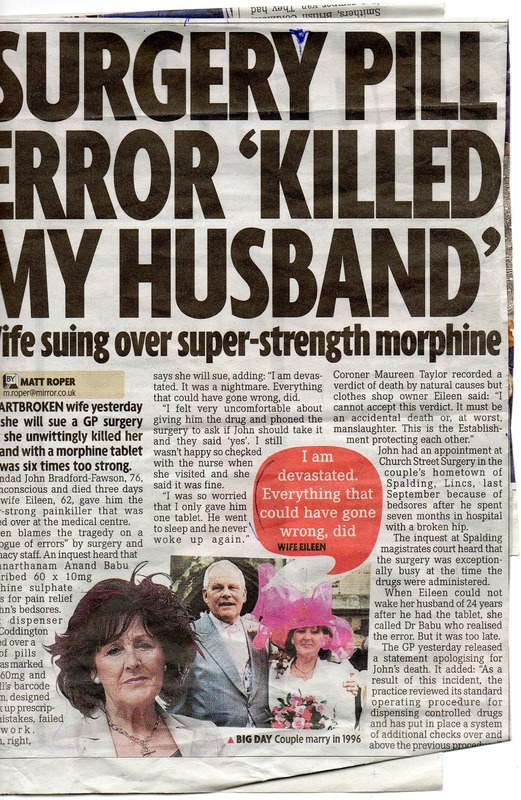 Oral medication is far stronger than tablet form.80mgs of Oral morphine would definitely have killed Linda's daughter. Below is a Swansea NHS Trust Discharge Letter dated 30/3/97 which clearly shows Linda's daughter was under the care of Dr Dewi Evans. The same date as the potentially fatal prescription was issued to Linda. Please note that this "Discharge Summary " is completely blank. No diagnosis.No investigations.Nothing on treatment/operations. Nothing on complications and nothing on comments. Why ? Simply they had no idea what was wrong with Linda's daughter and were panicking as they knew they were medically negligent and incompetent. 3 Months earlier in December 1996 Linda's daughter after spending 7 days at the old Neath Hospital was diagnosed as suffering from appendicitus by Dr John Elias. Dr Elias performed the operation which resulted in Linda's daughter suffering from severe scepticemia which nearly killed her. So bad was the infection that the wound could not be stiched as it had to stay open so that the poison could come out of the wound. A nurse came around every day to clean and dress the wound. The wound was never stitched up again and to this day Linda's daughter carries a scar for life.Later the family were to find out that the hospital in Neath had at that time no license to operate and no insurance. Another reason why the diagnosis section was left blank on the discharge form is that Linda's daughter had been mis diagnosed earlier with appendicitus. 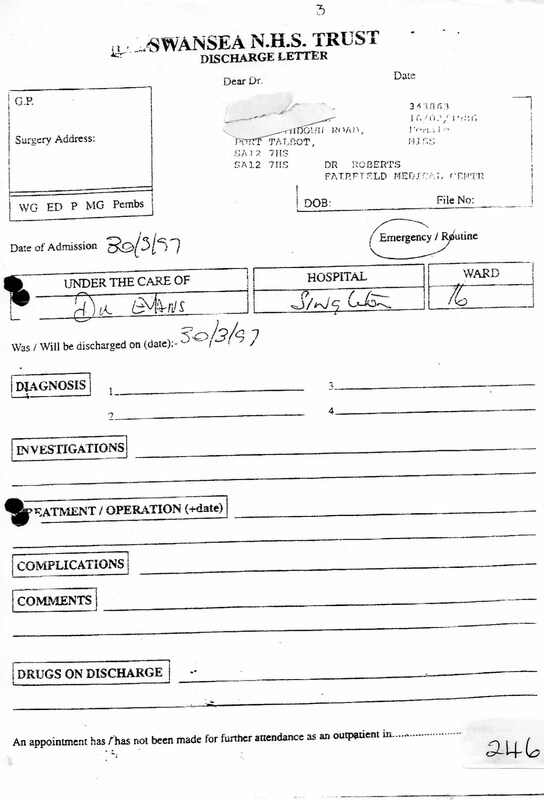 By placing any other diagnosis on the form Dr Dewi Evans would have admitted that the previous diagnosis was wrong opening the door for another " medical negligence " issue. But most importantly nothing on "Drugs on Discharge." They had just deliberately given Linda a prescription for her daughter that if administered would have killed her. I don't think they would have wanted that on an official hospital document. Thankfully Linda and her family were deeply suspicious of this prescription and did not give her daughter any. They knew that it was illegal for a Doctor to give a patient any medication without firstly being given a diagnosis. It is also illegal for a Doctor to release a patient from care without first giving a diagnosis. 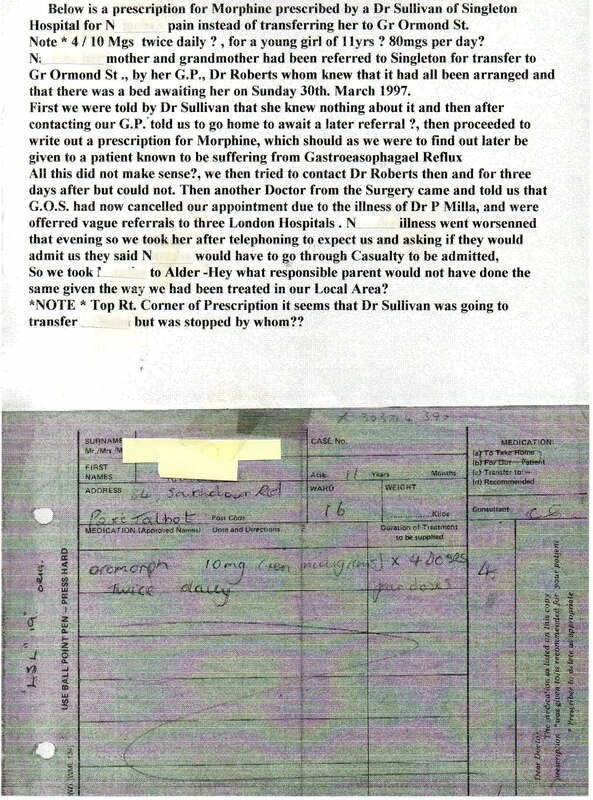 For those of you who are maybe still a bit sceptical about the scale of "medical negligence" that Linda, her daughter and her family were subjected to and is still being covered up today then please look at the following image. 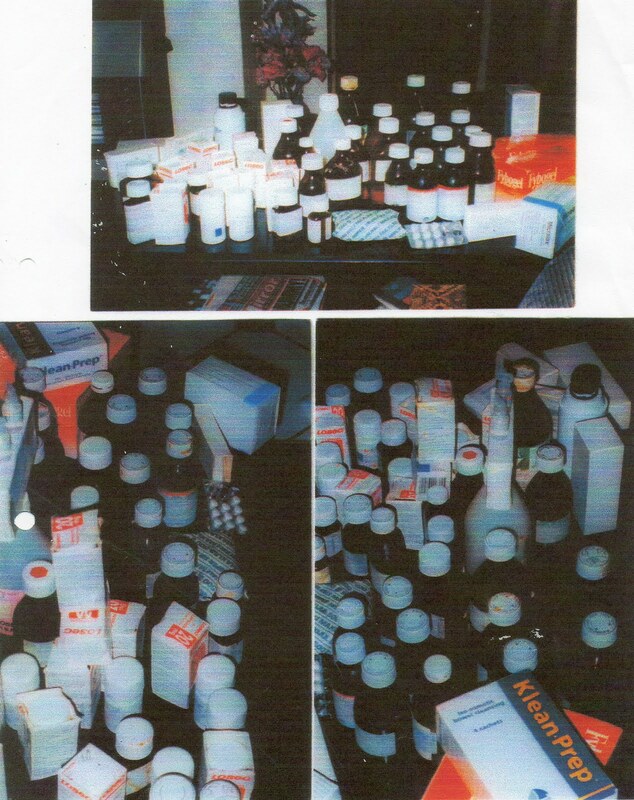 These are some of the drugs that were prescribed to Linda's daughter over a period of around 8 months. She never got any better ! Perhaps now you can understand why the family "at the end of their tether" legally took Linda's daughter to Florida to seek proper medical care. Equally you should now be able to see why the incompetent Doctors could not allow Linda's daughter to receive the correct medical treatment in Florida. If her daughter was correctly diagnosed medical negligence claims would have been started by the family on their return. Plans to " kidnap a 12 year old girl at gunpoint from her hospital bed at gunpoint on a false passport " were hatched. False evidence and false testimony was introduced. Linda was never allowed proper Legal Representation and both her and her daughters Human Rights were continually breached. That is why a conspiracy instigated by Social Services, The Police, Doctors, Welsh Assembly Members, Members of Parliament and the Judiciary is still shamefully being covered up today. This is a brilliant and damning article on th establishment Kevin Well Done. Don't forget that Dr Harold Shipman killed many patients by using morphine without any diagnosis as well. These Doctors should be arrested, tried and jailed for attempted murder. was a complaint ever made to the IPCC [police complaints]? this may not be the first case and won't be the last involving swansea nhs - hasn't a Mr Powell been trying to get the truth about the death of his son. It is too easy for the medical services, police, social services etc to cover up and get away with their failures at the every least until they have safely gone onto their pensions. it does nopt help when p[oliticians are sitting on bodies such as the Care Council for Wales? This is a matter for the Police to deal with Like you said if the Mother had given the Morphine to her child then she would have killed her. luck the mother had the sence not to give her child the morphine. The doctor who perscribed the Morphine should be arrested. If it wasn't for men like yourself, the evidence is overwhelming. wish you all the best in exposing this dreadful case. I agree with one of the comments regarding the police should be involved. hacking someones phone is one thing trying to kill a child is Crimminal. Feel sorry for all those involved. Good Luck you have our support here in the USA. If I hadnt read what you have posted I would never have believed this possible. What sort of people are they ? I would contact every Daily Paper. You and your team should take them down Kevin. What a "Masive Cover-up" The system in place could do with a good shake up. Articles prove that the child has been abused with drug's and kidnapped.We the taxpayer are paying for this no! wonder the Country is going bankrupt. Government should be asking Serious Questions about this case. This is absolutely scandalous it has brought me and my family to tears. The people who did this to a child are sick and should be never allowed to hold public office ever again. They are a blot of the deceny and integrity of everything that we SHOULD hold dear as part of our heritage. Criminals run our country I bet not one of them has a heart. This has to come out in the open soon.